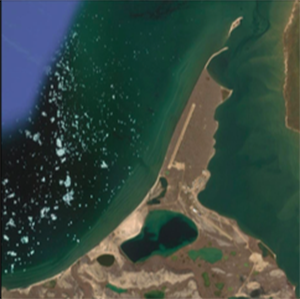 Analysis of Decadal-Scale Shoreline Change along the Hamlet of Paulatuk (Canadian Arctic), using Landsat Satellite Imagery and GIS techniques from 1984 to 2014. The analysis/research indicates that an amalgamation of factors are responsible for the patterns of land loss/erosion experienced along the Hamlet of Paulatuk. These include increased atmospheric and sea-surface temperatures coupled with dwindling arctic ice. The data also indicates that increased storm intensity (amplified duration of wind speeds) in this region, especially over the last decade, is a very potent cause of erosion. The study further reveals that the coastline along the eastern portion of the study area, where the majority of the population reside, is vulnerable to a high rate of erosion. Over the short-term (1984-2003), results indicate that the spatial extent of erosion has increased on both segments of the study area and erosion has, and continues to accelerate. This suggests that not only is the built infrastructure at risk to the near-term effects of climate change, but many of the invaluable cultural and environmental histories of the Inuit people in this area are at risk. Further, the coastal erosion in this region may act as a catalyst to releasing gas hydrates contained in the permafrost. Beyond their obvious advantages in enhanced spatial coverage and temporal resolution, Landsat has been extremely beneficial as it allowed us to frequently evaluate the movement of the shoreline based on data gleaned from one consistent source over the duration of the study period. Further, the continued use of Landsat will allow for ongoing monitoring of the coastline in this region to ensure that potential infrastructural improvements are sustainable based on projections of near-term climate change. How will or could your research help the residents of the Hamlet of Paulatuk? 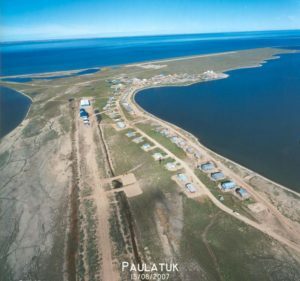 Our research presents the residents of Paulatuk with information on observed changes over a range of temporal and spatial scales of the coastline in their area. The results will highlight those regions of the coastline that are highly vulnerable to the effects of climate change and will facilitate likely adaptation strategies. This research was made possible by the Social Science and Humanities Research Council of Canada (SSHRC) grant number 781285.